There are few brands and products in the outdoor industry which evoke a response quite like Chaco sandals. Whether you associate the brand with river rats, hikers, festival-goers, or college students, Chaco’s reputation for durability, comfort, style, repairability, and grip in all but the gnarliest conditions (though frequently seen in some sketchy situations) continue to make Chaco a leader in the sandal category. Chaco sandals also happen to be a staple in my everyday and adventure kits. Chaco sandals are known for crazy comfort and simple webbing, which almost all of their sandals use. The specific hiking sandal I tested, the Chaco Z/1 Classic, is the most iconic of them all. No toe hold, a single strap, and the patented LUVSEAT midsole. The “Classic” is a revamp from the Unaweep, which used a Vibram outsole. Chaco no longer uses Vibram for its outsoles, so “Classic” ironically has a new outsole, which I put to the test. While we don’t award Picks for footwear (it’s just too subjective), the Chaco Z/1 Classic is, as the name implies, an absolute classic. We recommend it for every one of our Backpacker Types. It’s a perfect Car Camper, Day Hiker, and Urban Hiker sandal, depending on time of year. For Wilderness Backpackers and Ultralight Backpackers, you can use the Z/1 Classic (just read below), but be aware they won’t provide the protection of closed footwear, and you’ll want to make sure they are comfy (and broken in) before you’re deep in the wild. Check out the full Chaco Z/1 review below and see where they rank on our Best Hiking Sandals guide. Weight 14.9 oz. (422 g) per sandal Quite heavy for sandals, almost as heavy as some light hiking boots! Chacos are comfy, but man are they heavy. Category Open-Toe Hiking We categorize hiking sandals in four classes. Open-Toe hiking is the most airy and great for solid summer hiking and water sports. General Fit Standard/Wide Chaco sandals tend to fit a little wide, but because they’re sandals most feet will work. They have Wide models as well. Strap Material Polyester jacquard webbing The upper webbing is stiff out of the box, but softens up with use. Dries very quickly and feels pretty good against skin. Strap System 1 continuous strap, 3 adjustments Chaco is known for the strap system. It’s technically one continuous strap that adjusts in the midsole, but practically the Z/1 has 4 straps. The heel is not adjustable, but everything else is. Midsole LUVSEAT PU The LUVSEAT midsole makes the sandal, and is certified by podiatrists for comfort. It’s hard, and takes breaking in, but once you’ve done it the support is outstanding. Sole ChacoGrip Chaco’s new sole is non-marking rubber with 3.5 mm lug depth, and works well in wet and dry environments. Sizes Available 7-15 for Men, 5-12 for Women, no half sizes A decent number of sizes, but no half sizes. We recommend sizing up. Manufacturer Warranty Limited Lifetime Chaco’s sandals are warrantied for life. If a buckle or strap breaks, or if the outsole falls apart, send it in. Retail Price $105 A high price for a hiking sandal, but with proper care it can literally last you a lifetime. I’ve been wearing Chaco sandals for almost eight years now, and I can’t imagine my life without them. My five pairs of Chacos have visited Chile, rafted down rivers, trudged across deserts, and slogged through snow in the Sierra. They are my constant companion in the outdoors, and I have the tan lines to prove it. Maybe you can’t tell, but reviewing Chaco Z/1 Classic sandals for Backpackers.com is a bit of a dream come true. Dream moment with the Chaco Z/1 Classic sandals. Having worn Chacos for so long, I knew my main focus would be on the new ChacoGrip outsole, which is now made with Chaco’s proprietary compound and updated tread pattern. I had to come up with some curveballs to make sure I put the Z/1 through its paces. The “new” Chaco Z/1 Classic sandals do have a new ChacoGrip outsole, pictured here. Just how good are they? My summers tend to consist of a couple significant adventures interspersed with impulsive, minimally-planned trips. With a thru-hike of the 55-mile North Lake-South Lake Loop in the Eastern Sierra on the horizon for September 2018, everything became a training opportunity and the Z/1 Classics came along for the ride. I started breaking in the Z/1 Classics on our local bike path during lunch breaks and on the dirt hiking trail just up the valley. Carrying 20 pounds of water on your back and hiking three miles uphill is effective strength and balance training, but it does get old quickly. The Z/1 Classics then accompanied me to June Lake for a tandem paddle down Rush Creek. The secure webbing and grippy soles made for easy launches and dismounts, even on slimy rocks and muddy banks. The next day we hiked the Fern Lake Trail and climbed over 1,500 feet in 1.6 miles, all of which was steep, loose terrain. The Z/1 Classics handled the trail beautifully with only minor slipping on the steepest downhill sections. The Z/1 Classics excel on uphill. My final summer trip at altitude (before hitting the High Sierra in September) was an overnight to the Meysan Lakes near Mount Whitney in Inyo National Forest. I rarely wear sandals for backpacking trips, but I knew this would be the perfect challenge for the Z/1 Classics: a 10-mile out-and-back with a net elevation gain of over 3,000 feet. Alpine trails in the Sierra are dusty and rocky, and Meysan was no exception. Backpacking to Meysan Lakes with a pair of Chaco Z/1 Classics. Yes, you can do that. As we ascended that trail, I reflected on the comfort and security of my feet, which I was so accustomed to at home, at work, and on the water. Despite getting a new outsole, this was the moment I knew the Chaco Z/1 Classics were just as reliable as ever — and fit for the trail. The construction of Chaco Z/1 sandals have not changed much in the last 25 years, and the simple design still offers a ton of comfort and features to keep your feet happy on the trail. Chaco’s continuous, adjustable webbing built into the midsole of its hiking sandals is perhaps the most iconic feature of all. The webbing sinks into the midsole, and can be adjusted by pulling on the various ends to get the perfect fit. This can be tricky to master at first, but once the fit is locked in, you’re solid. The adjustment, however, can be tricky to master at first. The diagrams available on Chaco’s website are intuitive, but the pneumonic device I learned was way more helpful — Z/1: Knuckle-and-Buckle, Z/2: Knuckle-Toe-Buckle. For reference, Chaco offers Z/1 and Z/2 models — the Z/1s don’t have a toe hold, the Z/2s do. Z/1: Knuckle-and-Buckle: To tighten, pull at the strap at the knuckle of the big toe. Then pull at the strap with the buckle, on the inside edge of your foot. Then tighten the buckle to your comfort. Straps should be snug but not tight and allow for a pinky finger to easily slip between the webbing and your foot. Reverse on the outside edge of the foot to loosen. The Knuckle-and-Buckle adjustment for all Chaco Z/1 sandals. The Z/2 adjustment has an extra step at the toe hold (not pictured). Z/2: Knuckle-Toe-Buckle: To tighten, pull at the strap at the knuckle of the big toe, then pull at the strap at the toe. Then pull at the strap with the buckle, on the inside edge of your foot. Tighten the buckle to your comfort. Straps should be snug but not tight and allow for a pinky finger to easily slip between the webbing and your foot. Reverse on the outside edge of the foot to loosen. The Z/1’s adjustability came in handy during chilly evenings when donning my thickest winter socks. Socks-with-Chacos, or Sockos, are my favorite cool-weather footwear. They may not be stylish, but dammit if they aren’t cozy. Chaco’s new ChacoGrip outsole is designed for use on all types of terrain both in and out of water — and it has big shoes to fill (as it were), because the Vibram soles were excellent. The new outsole’s mix of deep lugs, wide channels, and flat surface gripped well when wading creeks and navigating talus and boulders on the final push for Meysan Lake. The old Unaweep outsole would hold onto mud until you had full dinner plates under your feet. I didn’t take the ChacoGrip sole through the worst mud puddles, but it did well after walking muddy trails and landing on soggy creek banks. Fishing in the backcountry is a luxury, and the water entry and exit is best done with a pair of hiking sandals. The Chaco Z/1 Classic gave grip, dried quick, and were supremely supportive while reeling it in. Because of the serious support, Chaco hiking sandals are heavy. Don’t underestimate the time it takes to get used to the weight and feel of the sandal if you’re not familiar with them. This makes them a less-than-ideal candidate as a camp shoe when backpacking unless weight is no object. The mass lies primarily in the polyurethane (PU) midsole, which is responsible for the stability and comfort of the sandal. PU tends to last significantly longer than EVA, which is lighter weight but more squishy than supportive, so there are trade-offs with each. Heavy with a thick, comfort-laden LUVSEAT footbed defines. The definition of the Z/1 Classic. The Z/1 Classic’s LUVSEAT footbed is ergonomically contoured to cradle your foot, and is unchanged. The LUVSEAT offers podiatrist-approved arch support that feels great, especially as a recovery shoe after long hikes or runs. The surface of the sole is etched with a hatch pattern to decrease foot slippage. Don’t underestimate this pattern, though: it has rubbed many a new owner’s foot raw during the break-in process if care isn’t taken. Chaco hiking sandals, specifically the Z/1, continue to be my daily shoes of choice for work and play, and comfort is why. The firm yet cushiony LUVSEAT footbed provides reliable arch support for all-day wear. Some people with sensitive feet or those accustomed to softer EVA soles found in Teva, Sanuk, or some KEEN sandals may find the PU midsole to be extra firm at first. Break-in on Chacos continues to be a long process. They are stiff out of the package, and the midsole takes a couple weeks of wear to soften up. Chacos are burly. Their simple design and tough components make them one of the longest lasting pieces of footwear out there. This pair still looks fresh after a couple months of hiking and backpacking in the California mountains. Also, the buckle at the instep is sturdy plastic and moves easily even when wet. I am highly skeptical of all things plastic due to its susceptibility to damage, and in all my years of wearing Chacos I’ve never broken a sandal buckle. My other reason for giving a rating of 5 for durability is Chaco’s ReChaco repairs program. If your Chaco’s midsoles are in good condition, you can have pretty much any element of the shoe repaired or replaced for a fee and it’s all done in the United States! I’m not going to lie: I miss the Vibram soles. There’s a brand loyalty and sentimentality aspect to all of this, and change isn’t easy. The Vibram soles were specialists. The old Vibram Unaweep soles were beefy and deeply lugged for secure footing on loose rock and decent purchase in the water. The old Vibram Yampa soles were primarily flat for grip in water and use in rafts and other crafts. The new generalist ChacoGrip outsole provides solid grip on pretty much everything I threw at it, from descending dusty alpine trails to climbing out of muddy swimming holes. That’s a plus for most users, but a specialist will always perform a bit better in their specific situation. The new ChacoGrip on the Z/1 Classic. More of a generalist, but still incredibly capable, this sole will work for most people. Specialists may miss the Vibram outsole. I knock off a point for a lack of smearing surface on the sole. Chacos are not for rock climbing, but a large surface area for purchase on slabs and slick rock, which were present on the Vibram Unaweep and Yampa soles, was always a plus. I can’t speak on the long-term durability of the outsole versus the Vibram soles, but the ChacoGrip shows barely any wear after a summer of adventuring. While not climbing shoes by any stretch, Chacos get used during climbs in a casual setting. The new ChacoGrip sole is good, but not incredible here. Chaco’s integrated strap system continues to be one of my favorite features. Once you learn the ways of adjustment, it is easy to adjust for security and comfort faster than a lace-up. The polyester strapping is comfortable against the skin and only gets softer with time. The straps are thick, but dry relatively quickly while hiking. The straps are adjustable and come in cool colors. My only gripe is that the straps become more and more difficult to adjust as dirt builds up in the strapping channels. Regular flossing of the straps can help with this, but let’s face it: I’m lazy. I have medium-wide feet and Chaco’s regular width continues to fit like a dream. The fit of Chacos is crucial because of the arch. 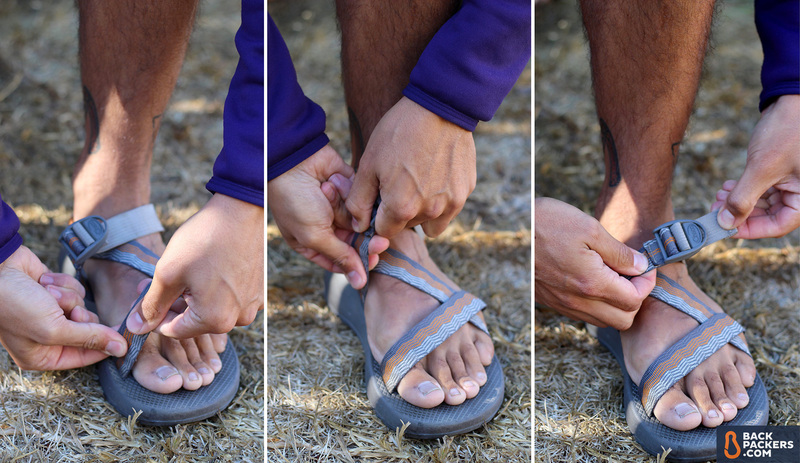 Be sure to fit your Chacos to your personal arch, and if you wear a half size in normal shoes, go for the size up. You’ll have a better fit and more toe protection. As I mentioned in the Straps & Webbing section, my only grievance is with the tendency of Chaco straps to get locked in place. If you wear your Chacos everyday in similar conditions or if you have a “city pair” and a “trail pair”, as I do, your straps being stuck in one position may actually be beneficial to you. The stationary straps also provide security and support on tough terrain. But if you have one pair of Chacos (like most rational human beings), it’s likely that you’ll wear your Chacos on variable terrain, and here’s the snag. After a few wears on the trail, the straps became tough, but not impossible, to adjust. I know from years of wearing Chacos that this will only get worse. Chaco recommends fabric softener and flossing of the straps to keep them moving freely. Is it a solution? Yes. Am I going to do it? Probably not. This review has become a character self-analysis centered on Chaco flossing habits and now I’m uncomfortable. This interview is over. We tested the men’s Chaco Z/1 Classic hiking sandal (the “/” isn’t loved by Google, so we don’t use it for our headers). The women’s version is the exact same, except for sizing and strap color. Chaco makes similar shoes — the Z/2 Classic is the exact same but with a grip for your big toe; the Z/1 and Z/2 Cloud has a lighter and softer midsole, but the same outsole, footbed, and straps. If you want the Classic, get the Classic, either with a toe hold or without. If you want a slightly softer experience, check out the Z Cloud series. Compare Chaco Z/1 Classic prices below.